Delta Rise Condos > Landmark Delta Condo Tower! 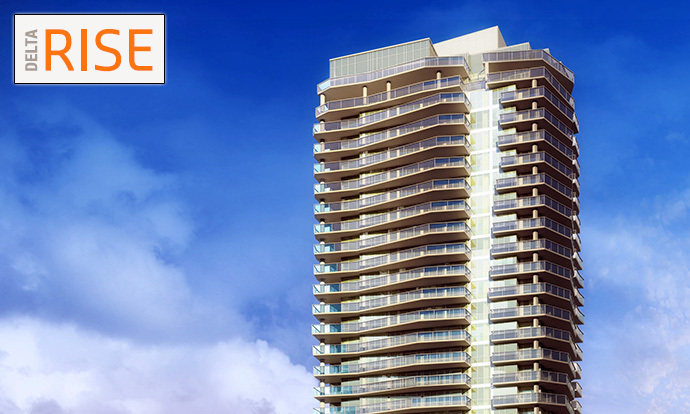 Grand opening presale Delta Rise Condos on NOW! Many people ask us what’s happening in the promising Delta real estate market. 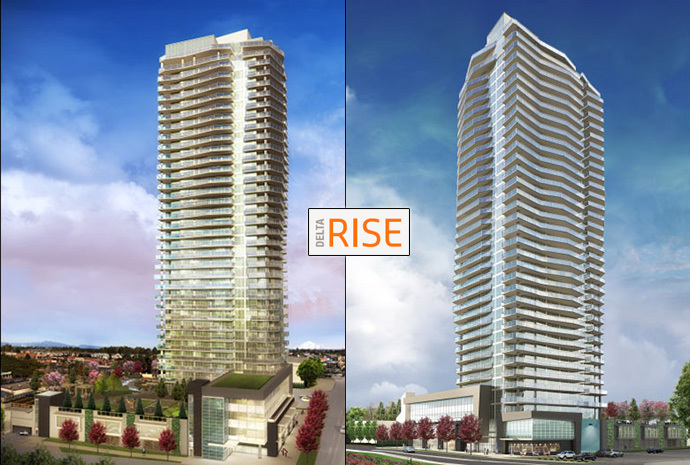 Well, first of all, the most highly anticipated and highly sought after new development is now previewing at the presale Delta Rise Condo Tower, a 37 story high-rise landmark in the heart of the growing city! The residential experience where the sky’s the limit is being developed by leading builder Blexo in conjunction with Focus Architecture, Creative Spaces Interior Design group and Van Der Zalm + Associates Inc. Delta Rise Condos by Blexo Development is the most ambitious high-rise community project in this city. The innovative and contemporary architecture is designed by Focus Architecture, a leading firm in the Lower Mainland. The curving exterior of the high-rise tower emulates the flow of the river and the Fraser River Delta lands around the area. As well, the landmark Delta Rise condo tower will have oversized low E2 glazed windows to optimize sunlight, fresh air and views for residents. As with all Blexo Developments Delta Rise condos for sale will be built with high-quality materials and will include Hardi panel siding, stone work and beaded vinyl and stained wood accents soffits. The preconstruction Delta condos will have secure underground and well lit parkade with emergency panic stations, fob only access as well as video surveillance for your safety. In addition, the pre-sale Delta Rise condo lobby will be accessible by key fob only with video surveillance plus an enterphone system. The high-rise will have 2 high-speed elevators with restricted floor access and all homes come with the comprehensive 2/5/10 new home warranty backed by National Home Warranty. There are secured bike storage rooms, storage lockers and car wash stations on site. The new Delta real estate development is within walking distance to groceries, amenities and services. Delta Rise Condos offers the urban convenience of coming home to a high-rise with great views, amenities and fine finishes. 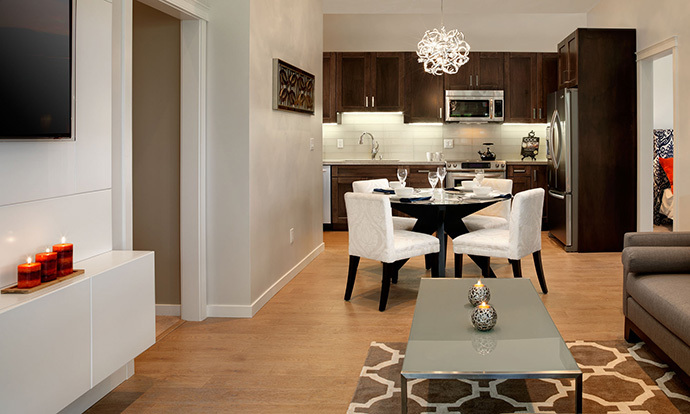 The presentation centre for the presale Delta Rise condos is located at 11941 80th Avenue Delta BC. For more information about this incredible offer, please visit www.deltarise.ca to register your interest now! The Soleil Layout is a Delta Rise Penthouse floor plan which offers a one bedroom plus one bathroom suite at 657 square feet featuring an expansive outdoor deck of 544 to 639 square feet. The Capeda Delta Rise penthouse floorplan is 2 beds and 2 baths at 939sf plus 497 to 555 square feet balcony whilst the Fraser is slightly larger at 977 square feet plus a deck at 1004 to 1314 square feet. The Panorama Penthouse at Delta Rise condo tower is 1,039 square feet plus 701 to 789 sqft deck while the Canterbury Penthouse floorplan is 911 sf plus 412 to 731 sqft deck. The Delta Rise Condo Features are Incredible! 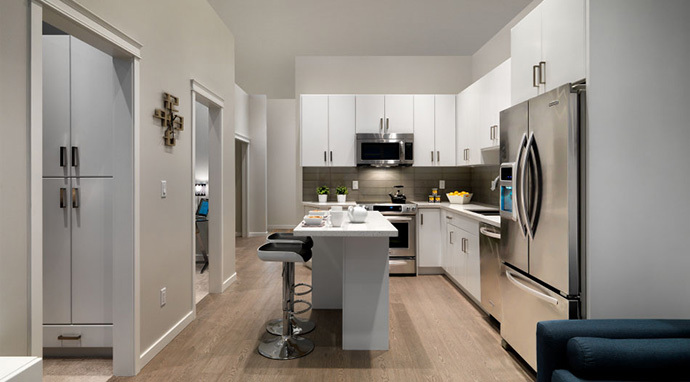 The stylish kitchens at this master planned Delta condo high-rise community by Blexo Developments includes superior features like open concept kitchens with KitchenAid stainless steel appliance set as standards. This includes a Classic Series dishwasher with fully integrated console design, over the range microwave with integrated hood fan, slid in self cleaning convection range with warming drawer and a French Door Counter Depth fridge with bottom mount freezer. The fridge also has a water filtration system built in, water dispenser and an external ice maker. The kitchens at the pre-sale Delta Rise Condo tower will also feature LED under cabinet task lights, sleek and polished chrome hardware, integral pull out sprayer in the single control faucet and polished solid quartz stone counters. There is also a Euro style stainless steel undermount sink with non skid removable sink grids. The beautiful kitchens at the preconstruction Delta Rise condo tower will include a floating laminate vanity complete with soft close drawers and LED under vanity lights. Dual flush toilets are high efficiency and there are oversized mirrors with vanity light bar, polished chrome hardware including rain shower head and single lever faucets. Porcelain tiled flooring and quartz stone counters are also standard features in addition to a deep soaker tub with integrated skirt and full height stacked porcelain tiled tub surround. Other interior features include a choice of two designer colour schemes (Casual or Comfort) and shaker style cabinets or contemporary Global Modern cabinetry. There are Venetian blind window coverings on exterior facing windows in addition to carpeting in the bedrooms and laminate floors in the main living areas. The pre-construction Delta Rise condominiums also feature KitchenAid appliances and Maytag stacked washer and dryer. There are over height ceilings and expansive windows too. All homes at the Delta Rise condos come with technology ready interiors, free Shaw TV and high speed internet for 2 years and low E2 glazed windows. As well, the pre-sale Delta Rise condominiums will have window coverings and barbeque friendly expansive decks that have glass railings and large entertainment sized spaces for outdoor enjoyment. 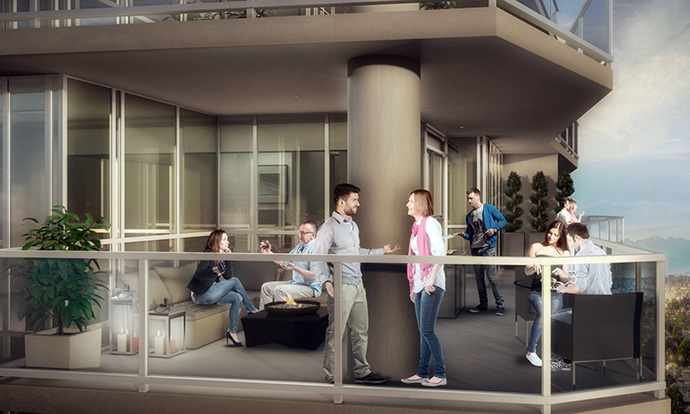 In addition to your own outdoor living space, there is also a community shared rooftop park at the top of the Delta Rise condo landmark tower. This incredible amenity space offers over a half an acre of green space plus amenities for residents. From relaxation to socialization and from entertainment to views, the new Delta Rise rooftop courtyard is the place to hang out year round. Here, you will find a Zen garden, trellised seating area, winding brook and an outdoor fitness area. 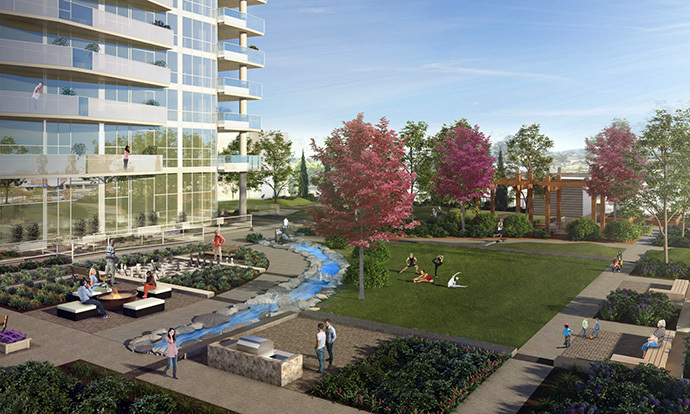 In addition, the Rooftop Courtyard at Delta Rise condos will include a chess board, open lawn, putting green, garden plots, playground and an outdoor barbeque pit to enjoy year round! 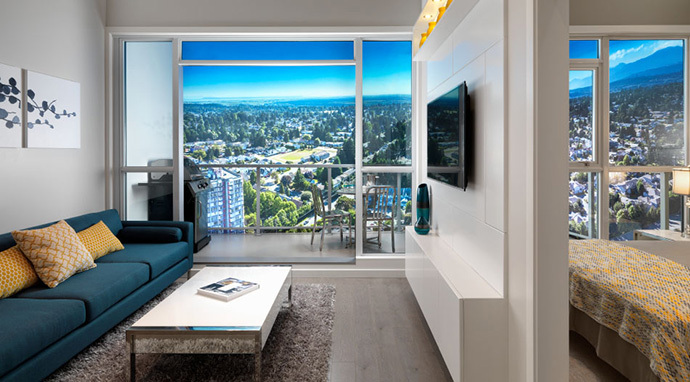 Other incredible highlights of this preconstruction Delta condo project by Blexo includes exceptional and functional home plans that have large outdoor spaces in addition to great views from the upper floors. The solid concrete construction ensures a long building life and the minimal maintenance will reduce your ongoing strata fees. Sound proofing will be excellent and there is allergen free ventilation. 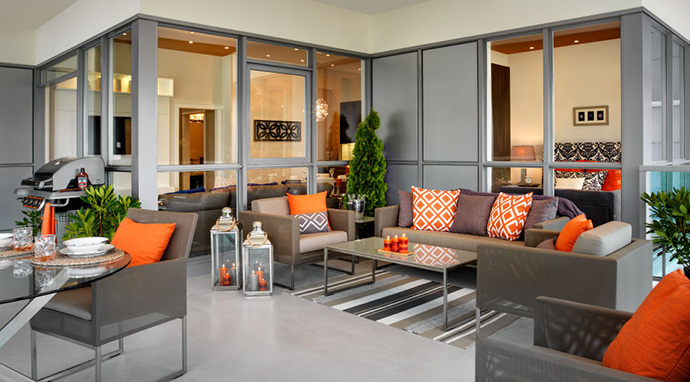 The flexible layouts at the preconstruction Delta Rise condos means that living environments are healthier for everyone. North Delta is moving up-and fast. Discover why it is a desired place to live, work, shop and play by visiting their marketing web site at www.deltarise.ca today!